Emmy Lou's little twins are Katahdin hair sheep. 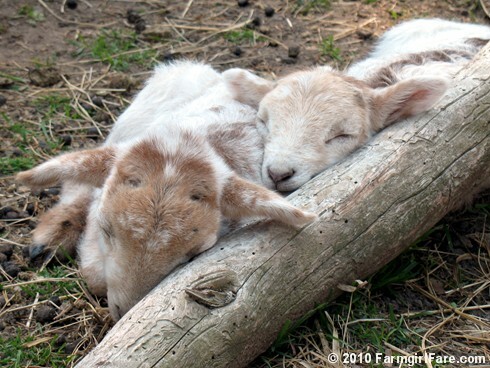 You can read more about our Katahdins here, and you'll find lots more cute lamb photos here. © Copyright 2010 FarmgirlFare.com, the ready for bed foodie farm blog where farm life is fun but exhausting—and sometimes I really miss the luxury of ordering takeout. (We can't even get our mail delivered out here, let alone a pizza). Time to find some dinner and then snuggle up under that quilt! I'm not sure I could do without take out. Although having those sweet little lambs around must make it easier. Aw, that is an extra sweet photo! It is hard to imagine exactly your farm life because I know farming is a tough, hard-working, 24/7, day-in day-out life, but thank you for sharing it with us - those babies are so precious. I wish I could at least visit and see it all in person.